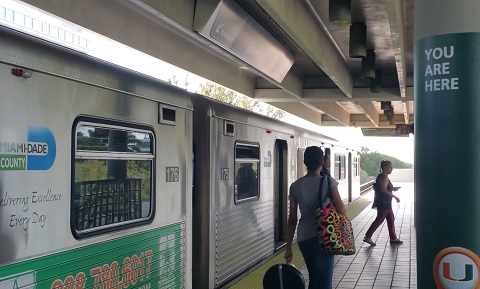 The University's Transit Program offers incentives and discounts for full-time students, faculty and staff using the Metrorail, Tri-Rail, Metrobus, and Miami-Dade “Park and Ride” express buses. Full-time students get fares at 50% off the regular price when you bring your Cane Card to the University Center ticket window or call 305-284-2318. College Easy Pass must be purchased before the 9th of the month. Faculty and Staff with full-time status receive a Metro-Rail and Tri-Rail pass at a discounted rate based on annual salary (see chart below for cost structure). To join the program complete this form by the 14th of the month or email mxr1598@miami.edu for additional information. Additional benefits are available to employees returning their Coral Gables campus parking permit to use or are already using alternate transportation. For additonal information contact mxr1598@miami.edu or call 305-284-1547. Vendors and Contractors can also take advantage of discount fares and transfer programs offered by Miami Dade Transit. Some discount categories include Golden Passport, Patriot Passport (Military Veterans), Commuter Reduced Fare, and People with Disabilities. Make sure you enroll in the Emergency Ride Home (ERH) program through this link and receive 6 ERH vouchers when you register your Tri-Rail commute. For Tri-Rail renewals click here.